Before I share my personal opinion on this classic - by a lot considered - great shaving soap, I need to stress, that this is my personal opinion based on my experience through a couple of years of testing this soap on and off. I think I have used Mitchell Wool Fat, from now on called MWF, between 15-20 times. I have a large rotation of soap and creams, several 100, and I try to rotate them all pretty much evenly through out the year. I began using MWF for the first time in 2012, at that time lived in Copenhagen, where the water is hard and rough. Could not get MWF to lather. Tried all the advice, soaking MWF for 10-15 minutes in warm water, soaking it completely covered in the ceramic dish. Did not work. Only way MWF worked for me was in a Superlather with another soap/cream, and I could then see the benefits from the great post shave feel, MWF provides. Also found MWF works better with a boar brush, than anything else. But still MWF was a fickle shaving soap. I saw YouTube shavers having trouble with it, Nick Shaves and others. I saw shavers creating a great lather from MWF without problems. I moved back Copenhagen in a new condo in 2014, and once again MWF went for being tolerable to use, to almost unbearable and lousy. But MWF was NEVER EVER what I would call even an acceptable shaving soap. I had been in denial, knowing MWF fans I respected HIGHLY, such as Johnny, loves his MWF and gets fantastic results from it day in and day out. I was living in denial. Used MWF 6-8 weeks ago again, soaked the puck, loaded my Stirling KONG brush for a good 5 minutes. The MWF ceramic bowl was filled with lather. Got rid of the excess starting thin bubly lather. Continued loading the brush heavily. Face lathered adding water slowly 4-5 drops to the brush at a time. Lather was almost crashing, thin bubly low quality lather. I was again stubborn. 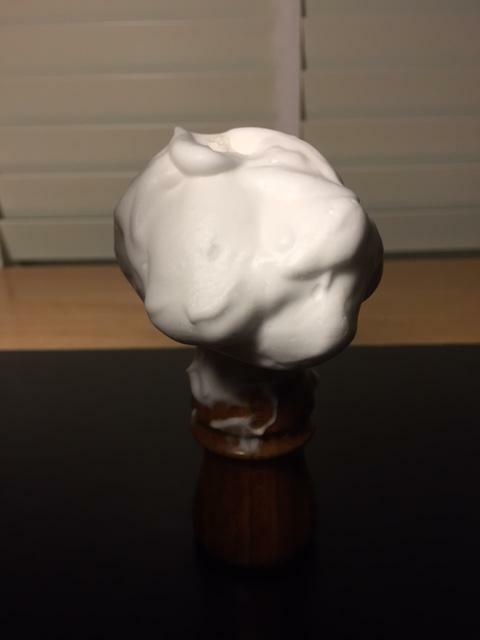 Continued face lathering for 10 minutes, got a barely acceptable kind of thick lather. Shaved, ok result. Post shave feel great. Everything else not so great. Then on to this mornings shave. The 25.th of December 2016. The day Claus, not Santa-Claus, but just Claus, finally stopped living in denial in order to try to please others, the day Claus got rid of both his pucks of MWF and took the Savonniere du Moulin shaving soap and placed in the fantastic MWF ceramic dish, the only really amazing thing about the MWF shaving soap, besides the post shave feel. Used my Thäter 30 mm 4125 2-band bulb brush. I did purposely not soak the MWF this time. I was testing it, and if I/MWF failed, we were to not live together any longer. To compensate for not soaking MWF, I added much water to the brush, and I loaded the brush very heavy. I looked at the clock while loading it with MWF. I loaded the brush with MWF for 11 minutes until lather was dripping out of bowl. The brush was totally loaded with MWF. Started out thin. Continued to be somewhat think looking. Added water to the brush several times. Same thin looking lather. Continued to face lather for 15 minutes, yes 15 minutes. Once I got a good looking lather on the right cheek, the lather on the left cheek dissipated. Just like MWF lather does on me and for me. Once I got a good looking lather on my neck, the lather was bubbles and airy on my cheeks. As said, I face lathered for 15 minutes. 15 MINUTES MWF FACE LATHERING AFTER 11 MINUTES OF MWF BRUSH LOADING ! MWF so called lather looked like only one other shaving soap, which I binned months ago: Lea Classic. Stop living in denial, Claus. MWF and you just are not a good match. Accept it. MWF has got to leave. Now. Consequently wiped off the so called poor excuse for a 'lather' on my face, took the MWF puck and threw it out in the trash, where it rightfully belong. I own 100's of shaving soaps. Only 2 have caused me problems : MWF & Lea Classic. Out they went, both of them. 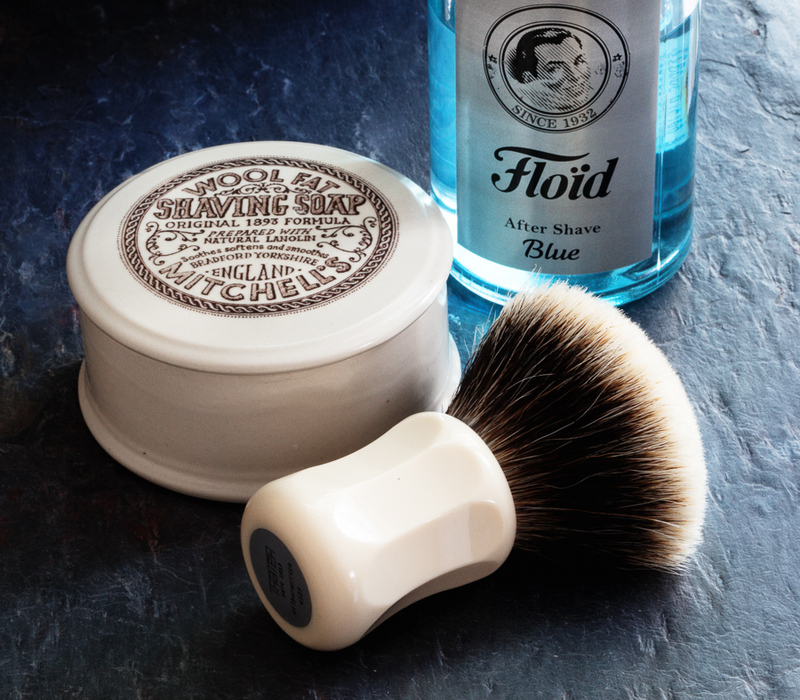 Took my CRSW v2 Le Chypre Sombre shaving soap in the blue ceramic CRSW dish, loaded the same brush for 1-2 minutes. Brush was heavily loaded with CRSW soap. Began face lathering. In 1 minute I had the most amazingly looking thick, dense lather full of volume and shine on my face. I could have taken so many other soaps from my den, but I felt like reaching for something, which also comes in a beautiful ceramic dish, so Larry's CRSW Le Chypre Sombre, a very well made Drakkar Noir clone, was the first soaps I thought about. Boy, does Larry's shaving soaps perform like magic. MAGIC. They are as close to a PERFECT 10/10, as possible. Goodby MWF, I will not miss you at all. I feel you, to me MWF is not worth the effort. There are soaps where give me same or better post shave, and actually smells good, that lather easily. Mwf worked for me and a few others but I applaud you trying that much and that long. Some people finished a whole shower in the time it took you to give mwf a final chance. Pity you binned it though should have kept it as a display that not all soap could be conquered. Claus, I'm surprised you stuck with it for so long and so much effort to try to make it work. If a soap doesn't work for me, it doesn't work for me and I would move on to something else, we're lucky to have so many options these days. We're all different, there's no one product that works for everyone. I have the same problem with T&H G.F.T soap, and I have tried 2 of each this was a couple off years ago now but will never ever try them again totally waste of money and TIME. The same is it with Portland General Store soap they are all just bath foam. But the MWF is producing nothing but thick, protecting and slick lather that have a nice post feel. You should have used it as a bath soap. Pity it didn't work for you. I'm right there with you Claus. I gave it a good number of tries (granted, nothing like you afforded it) and it just did not work for me. Once I've gathered enough stuff it will been seen next on the BST. Despite all its accolades and praises, MWF is just not for me. Claus, I love MWF, my favorite soap, but I also greatly enjoyed your write-up. Nicely done! Claus, I have had the same bad experience with MWF. This is a product that really needs a reformulation so that it works for hard and softened water. In the mean time, my MWF ceramic container will hold a fantastic puck of haslinger schafmilch. Claus, I am so sorry it did not work for you and I appreciate the effort you put in to it trying to make it work. But I guess it is just not for everyone. It is still my favorite and could be the only soap I use, if I had to. Know that I will be thinking of you every morning that I use my MWF. Claus, I fully understand you. I can't say that it's a bad soap, but I don't have the patience for it. It takes more time than any other soap to make a good lather. I used to lather it with a boar brush, like the Omega 49. And I agree that Larry's soaps are better performing ones than MWF and many others. I have successfully used MWF for years, but put it in the garbage just this morning. With all the excellent artisans, as well as Tabac and Cella, I found MWF less and less appealing. I still consider it a high quality soap, but I need to start downsizing the den. (12-25-2016, 10:08 AM)Teddyboy Wrote: I have successfully used MWF for years, but put it in the garbage just this morning. With all the excellent artisans, as well as Tabac and Cella, I found MWF less and less appealing. I still consider it a high quality soap, but I need to start downsizing the den. That funny, I started downsizing but in the opposite direction than you did. First thing I got rid of was most of my artisan, Tabac, and Cella products. In addition, I’m very fond of MWF’s scent and, as Claus pointed out, its great post-shave feel and the fantastic MWF ceramic dish. MWF works OK for me, but I wholeheartedly agree that I do not have time for fickle soaps. Well I have to applaud giving the soap every chance available to satisfy. Unsure what the problem could be but have to agree with others that it's likely a function of the water used. Personally, I've not had the same issues some have with MWF. It lathers just fine for me, gives an amazing shave, and leaves my skin feeling wondeful afterwards. But if something doesn't work, particularly in the shaving realm where there are so many amazing products that do - I say move on. I think it would be interesting to see pictures of the lathers from folks from both sides of the fence. I've never used it myself, but only smelled it (and enjoyed that aspect). (12-25-2016, 07:11 PM)Nero Wrote: I think it would be interesting to see pictures of the lathers from folks from both sides of the fence. That's sounds like a good plan. A MWF lather pics. Edit : had a random thought. Some of us needs a yoghurt consistency lather to enjoy the shaving. Are those that didn't succeed with MWF those that needs a yoghurty lather ? 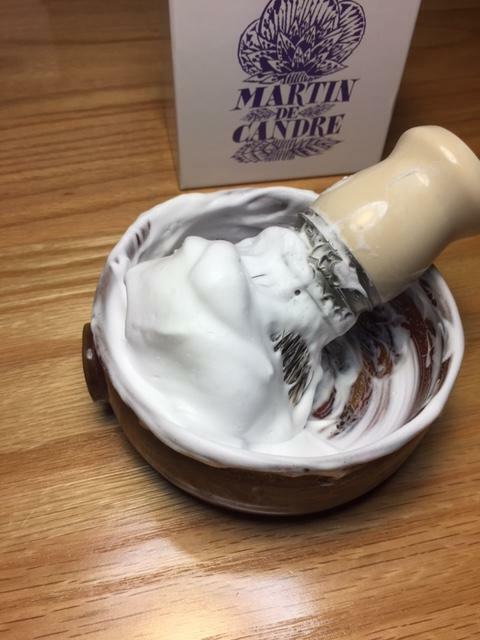 this is exactly how my MWF lather looked liked (when I was still trying to get it work for me), but I always considered this kind of airy consistency lather being subpar. Below is my benchmark of the exemplary lather which, I made using one of my all time favorites a)MDC and b) ABC, which unfortunately started irritating my skin. I could never ever ever achieve even half of this consistency and stability with the MWF. I guess I am one of those who needs that yogurty-type lather to enjoy my shaves.